The 2009 thunderstorm season was one of my finest years to date with high instability during the Spring and Summer months producing huge multicell storms, two possible supercells, the best shelf cloud I have seen, 7 funnel clouds, and a frightening severe squall line with produced damaging winds which sounded like an approaching tornado complete with night time lightning. Combined with the best Noctilucent Cloud displays I have ever seen and a Halloween fireworks display, I would place 2009 as the benchmark in standard for future years!. 15 image accounts here. August has been a wild month for bad weather over N. Ireland. Yet another warm front crossed over the country followed by two cold fronts due to a low pressure system over the Atlantic Ocean. The unstable airmass behind the last front was expected to produced thunderstorm activity on August 20th. After an uninspiring start the day turned into a success when I encountered a growing storm with nasty gust front over Toome followed by a second over Ballyronan Marina. Both of these produced intense rain, hail, powerful wind squalls, and lightning over the E side of the basin with a dramatic drop in temp. This was certainly a wild weather day. One page report with 18 images and 1 video clip. - REPORT. 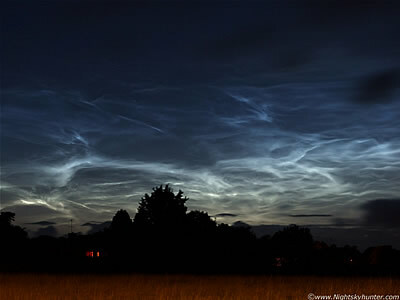 This is the direct link to the complete Northern Ireland Noctilucent Cloud (NLC) gallery featuring images from 2006 to the present season and also documenting the incredible NLC season from Maghera, N. Ireland during 2009. The gallery concentrates on my favourite major displays, with the main feature being the most incredible Armageddon-style NLC display which I have ever experienced in my life on the night of June 18/19th which sported out of this world structure making it a possible once in a life time display. Thanks to a deep solar minimum this was the best NLC season I have ever observed to date. The text under the images will help explain what was happenign which I hope will help readers visualize what it was like to be there. - GALLERY. July 21st 2009 turned out to be yet another action-packed storm day over N. Ireland when the latest GFS 18z run upgraded the set-up to 1000 CAPE and LI of -4. Between 18.00 - 19.30 BST I observed and photographed five multicell thunderstorms which passed over Maghera and the Sperrins from the S producing pink c-g and i-c lightning, low level bases, and intense precipitation curtains while thunder rumbled across the mountains making for one of those classic Summer Thunderstorm events. One page report with 18 images. - REPORT. July 15th was yet another exciting storm day across N. Ireland with strong instability and a series of troughs and convergence zones which were expected to produce strong thunderstorms during prime heating time. 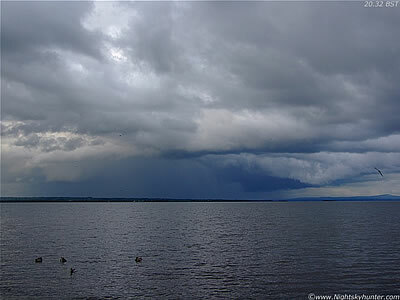 The day began with a nice thunderstorm over NE Maghera followed by a chase to Ballyronan Marina where we observed a well defined funnel cloud for 15 min's duration and a nasty storm over the NW shore of Lough Neagh itself. Two page report with 30 images and 2 video clips. PAGE 1, PAGE 2. 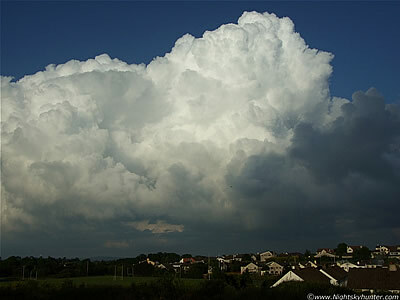 July 14th 2009 was a great day for storms over N. Ireland with high instability and slack Sly air flow with numerous troughs and convergence zones. Wide spread storms developed during the afternoon and late evening over W and N areas of the country. During the late evening I was treated to a gorgeous line of strong multicell convection over E Maghera before sunset which produced a brief funnel cloud (not photographed) and a wall cloud for a duration of 15 - 20 min's with possible tail cloud. It was the appearance of these huge cells which made the day such a treat. One page report with 16 images and 1 video clip - REPORT. 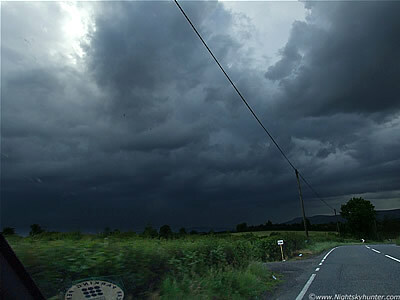 On July 4th 2009 a forecast for powerful thunderstorms was issued for N. Ireland. Tipped off by a member of the UKWW forum who observed a severe cell with overshooting top from 50 miles distant, and heading for Maghera, I headed out and watched two huge storms which delivered c-g lightning, gun shot thunder, and torrential rainfall. The 2nd storm produced a wonderful flanking line from which a white rope-shaped funnel cloud dropped into view (not imaged). After these storms a chase ensued across the country and mountains as severe convection exploded over the Sperrins in the late evening low Sun. Another great storm day in N. Ireland. One page report with 15 images and 1 video clip. - REPORT. This is the 2nd image account from Monday June 15th 2009. After two T-storms over Maghera during the afternoon a calm evening followed. Before sunset Ryan McDonald and I observed a distant funnel cloud emerge from the base of a powerful cell consisting of exploding towering cumulus clouds above the countryside in the NE side of town. The funnel changed shaped constantly for 10 min's from an inverted cone to a slender tube before vanishing into the base of the cell due to inflow winds affecting its orientation. A great end to three days of action which produced 8 T-storms and 3 funnel clouds. One page report with 20 images. - REPORT. 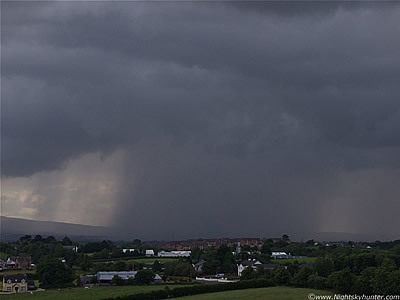 Monday June 15th 2009 was the final day of a trio of storm events across N. Ireland with high instability and intense ground heating triggering showers and storms across many parts of the country. 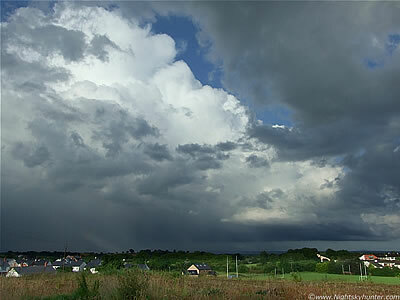 On this day I observed two thunderstorms and two funnel clouds from Maghera. I have decided to split the day into afternoon and evening accounts. This account features one of those early storms which had a nice updraught/flanking line from which dropped a short lived funnel cloud. I also seen the most severe convection in my life this day. One page report with 11 images and 1 video clip. - REPORT. 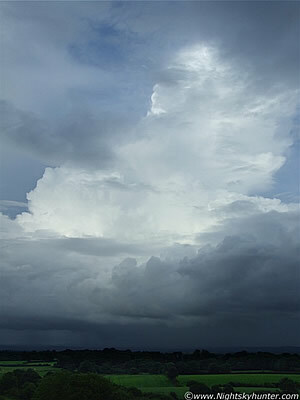 This is the second image account from June 14th 2009 detailing the 3rd thunderstorm I caught this day. During the late evening we intercepted an organized storm over the Ballyronan area as it approached Lough Neah while producing multiple pink coloured c-g and I-c lightning which illuminated the green precip curtain from behind. Above this was the finest shelf cloud I have ever seen from N. Ireland sporting two tiers and of large vertical and horizontal extent. This was a day which I will never forget. One page report with 13 images and 1 video clip. - REPORT. 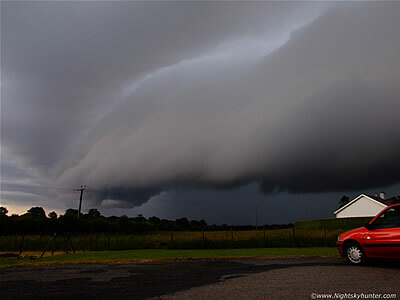 This is the second image account of five covering three days of thunderstorm action over N. Ireland. 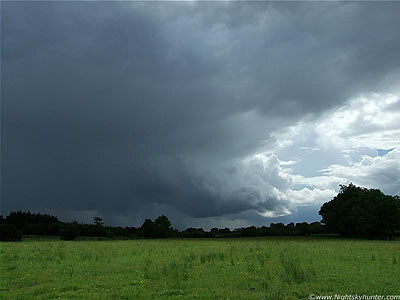 On Sunday June 14th 2009 I observed three thunderstorms which I have split into two different accounts covering the afternoon and evening events. This account covers the first two local storms of the day which produced a suspicious lowering, blue c-g lightning, and torrential rain over Maghera. One page report with 20 images and 1 video clip. - REPORT. The first of four image accounts covering three days in a row of storm action over N. Ireland. June 13th produced a storm over Maghera, Slieve Gallion, followed by a funnel cloud from Draperstown with the chase ending back home in Maghera when the most electrically active storm in years arrived during the late evening with almost continuous lightning which actually killed a Sheep in close proximity to me. One page report with 25 images and 1 video clip. - REPORT. 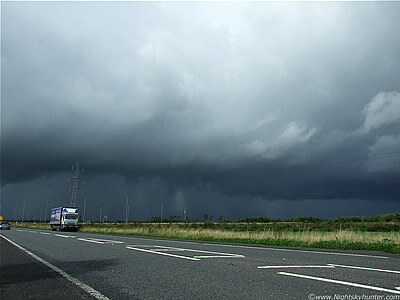 May 21st 2009 was the fourth day in a row which produced thunderstorms over parts of N. Ireland. Aside from a rumble of thunder on the 20th I had missed much of the action from Maghera. 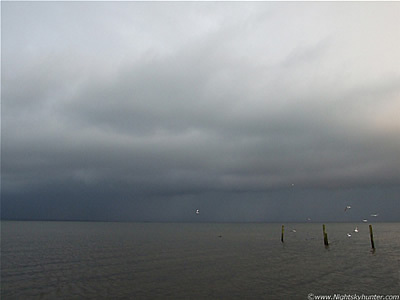 During the late evening all that changed when I observed a funnel cloud drop from a wall cloud under a large cell over the NW shore of Lough Neagh from Ballyronan Marina, under difficult conditions. The funnel may even have been a waterspout at one stage. Also included are rainbow images and dramatic storm clouds at sunset which I shall never forget. Two page report with 28 images and 1 video clip. - PAGE 1, PAGE 2. 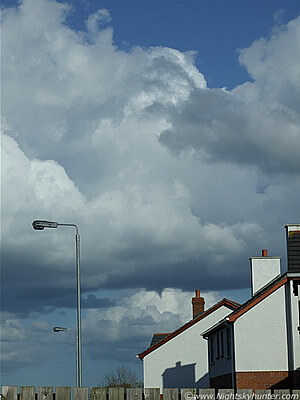 May 10th 2009 was a glorious sunny day over N. Ireland, and not surprisingly no convective forecast or poor weather was expected. However, a large area of vorticity formed with slow moving convective updraught towers during the afternoon exhibiting rotation. 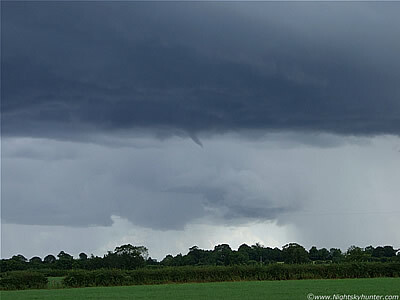 At 16.10 BST I happened to glance out my back door and observed a small funnel cloud in the E sky which lasted for a duration of 5 min's. A nice little dark inverted cone sporting obvious rotation. A wonderful surprise on such a fine day. This was my first funnel cloud sighting of 2009. One page report with 3 images. - REPORT. 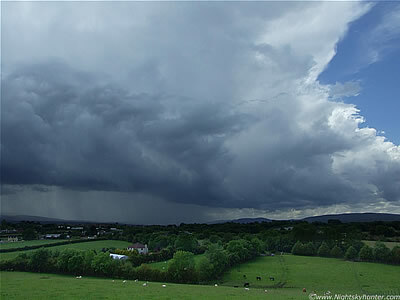 On April 25th 2009 a long duration thunderstorm formed over Co. Antrim during the late afternoon which produced flooding, thunder, lightning, and golf ball sized hail stones. 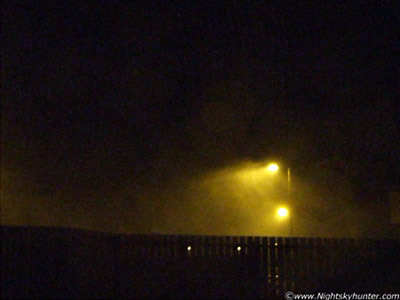 Observations and images from the Maghaberry area showed a wall cloud and a suspect Mesocyclone within the cell. During the late evening I managed to observe this cell over Lough Neagh from Ballyronan Marina when it produced lightning over the Lough before dying out after sunset. A very action packed day. One page report with 9 images and 1 video clip. - REPORT. During the hours of darkness just before 20.00 UT on Saturday March 7th 2009 an intense cold front moved in over N. Ireland driven by a low pressure system over the Atlantic Ocean. The leading edge of the cold front created large convective cells which then formed into an organized line of storms called a squall line. The squall line reached severe levels when it produced brutal gusts of wind at 87mph combined with horizontal rain, hail, thunder,and lightning which continued across the country causing some localized damage. This report documents my own account of this severe event when it hit Maghera and includes the reports from others across the country. One page account with 1 video clip and 2 video stills - REPORT.